If only the problem was that simple. Beel has read the recent report describing PCB contamination in a small reservoir near Donna, Texas. 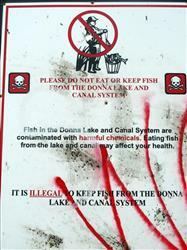 The contamination was discovered in 1993, when a carp caught in the Donna canal was found to have more than 1,500 times the limit of PCBs believed safe, the highest such reading ever. Ever. PCBs, typically found as oily liquids in electrical equipment, have been banned in the U.S. since 1979 after causing cancer in animal testing. Scientists believe that PCBs can result in lower birth weights, suppress the immune system, and increase the risk of cancer. Well, obviously a wealthy state like Texas would clean this up, wouldn’t it? Instead, Beel reads that state and federal officials have gone door-to-door to warn residents about the contamination and have instituted a $500 fine for anglers caught with fish from the lake. On two separate occasions federal authorities removed more than 35,000 fish from the Donna Reservoir and the 6 1/2-mile canal that brings water from the Rio Grande using electrofishing. But the fish keep returning. Almost as if they move upstream from the river, into the canal, and from there into the lake. Beel says, this is not rocket science. Some anglers continue to fish in the lake, releasing their catch. Others keep the fish for sale or personal consumption. Beel found a 2010 Public Health Assessment Donna Reservoir and Canal System, Donna, Hidalgo Country, Texas, which provides a great deal of additional information on this. 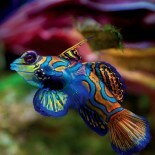 This entry was posted on March 4, 2012 by denstormer in Commentary and tagged environmental concerns, USA.